I’m your host Abby Lewtas. Come on an adventure with me as we wander into the minds of globetrotters. They’ll share their travel stories, navigating their return home and stepping into their inspired adventurous life. Click for all links and show notes. Be a guest on the TWM Podcast? The Wanderlusters Mind is now accepting guest applications. If you would like to be considered please send an email to abby@abbylewtas.com letting me know about your travel journey and how you are now living an inspired adventurous life. Please make sure to listen to previous episodes to get an idea of the stories I share. Interview with Cydny and Marc Voicechovski on the Goal Traveller Podcast. We chatted about how a competitive spirit can bring on Big Adventures Click to listen. Interview with Grace Gufler on the ‘what I wish people knew’ podcast, a podcast discussing a variety of psychological and counselling topics. Click to listen. Interview on the We Travel There podcast where I chatted with Lee about travelling to Melbourne. Insider tips for tourists from my time spent living in Melbourne. Click to listen. Interview on the Create a Life that is Beautiful Podcast with Leticia Ringe, a podcast to inspire, empower and support you on the journey of uncovering your purpose and truth in the world. Click to listen. Interview on the Trinspo Podcast with Heather Walicki, Instead of focusing on travel tips or sights, we feature a travel story each week and discuss our joys and mistakes while taking adventures around the world. Click to listen. Interview on the Thinking Liberty Podcast. 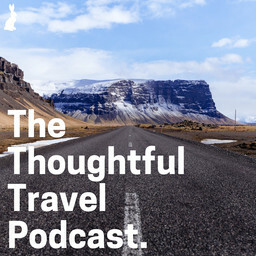 A travel podcast hosted by Zach and Sarah Varnell. Where they dive into other ways that people are living free, travel-oriented lifestyles. Click to listen.